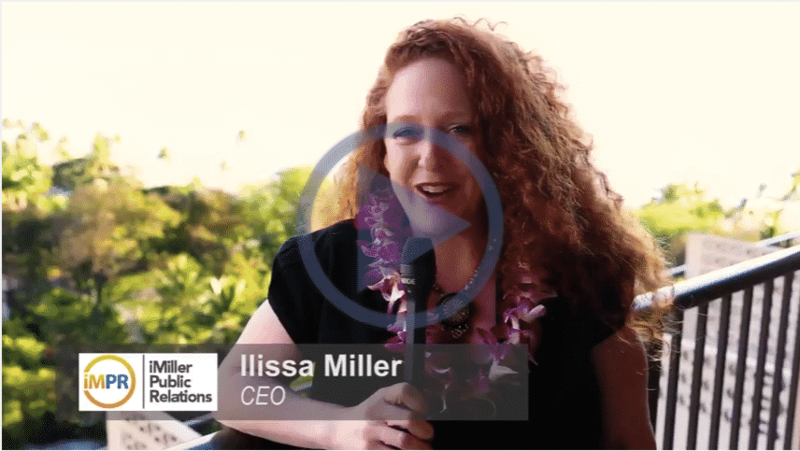 iMiller Public Relations (iMPR) Founder and CEO Ilissa Miller recently spoke from PTC’17 in Honolulu about the company’s event and content marketing strategies in this brief video. At PTC’17, which took place January 15-18, iMPR provided support to nearly two dozen clients in attendance, maximizing companies’ ROI through such activities as identifying thought-leadership speaking opportunities for executives; media relations; promotion of event participation prior to the event; end-to-end onsite management with the event organizers, including hotel and conference room booking, meeting management and registration; as well as development of overarching communications and targeted social media strategies, and pre- and post-event reports to ensure key benchmarks are met and providing recommendations for next year’s conference. As Ilissa explains, iMPR also recently expanded its conference and trade show marketing expertise with the addition of Cheryl Kemp as Vice President of Events. Cheryl, who has nearly 14 years of experience in event marketing and public relations, will be spearheading all event initiatives and partnering with conference and tradeshow organizers to amplify brand recognition and awareness for iMPR clients. Additionally, as Ilissa comments during the video, iMPR is elevating its content marketing strategies by working more closely with its global media partners, as well as top-tier trade and business publications throughout the industry, to continue to develop content on behalf of our clients that is engaging, useable, accessible and educational.